The Classroom Library Project began as a conversation in our literacy co-op. As part of our learning, we often share professional texts. Together we were reading and discussing the book Passionate Readers, by Pernille Ripp. We were discussing chapter 3 entitled, The Classroom Library as the Cornerstone of the Passionate Reading Community and wonderful conversations began. Realizing we wanted to share these amazing ideas with as many teachers and students as possible we worked together to create the Classroom Library Project! A Google form was created and shared with all classroom teachers. 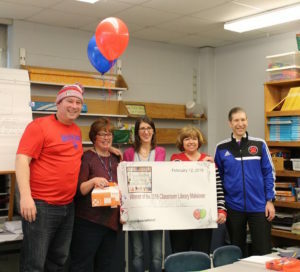 They were notified that one teacher per elementary building would win a Classroom Library Makeover. When students enter the classroom is it apparent that books are important? Is there an organizational system that makes it easy for all students to find books they are excited to read? Has the classroom library been weeded out lately? Are the book displays in the classroom engaging? Would you like to give the library a fresh look to engage your readers? If so please fill out the Google form to possibly win a classroom library makeover. The questions were designed to help teachers think deeply about their current library and the possibilities of a redesign that would engage their readers even more. Questions focused on student involvement in the process, the organization of bins and bookshelves, book displays, seating options, book talks, library collections and more. (Click on the link to see the actual form.) 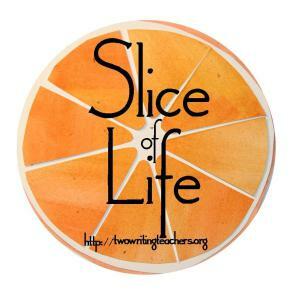 Teachers were given a little less than two weeks to complete and submit the form. 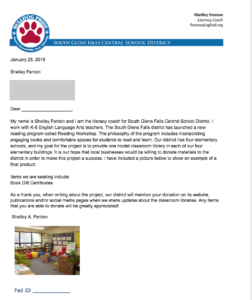 While teachers went to work on the forms we created letters to give to local businesses asking for donations for the project. (see the sample letter.) The letters focused on the philosophy of reading workshop, and our hopes for engaging students with reading. It included a picture of an organized, charming, appealing classroom library. Lastly, the promise of publicity on our website and social media outlets were included. We received over 20 completed questionnaires. Now the hard part, deciding which classrooms would be involved in the makeovers. The plan was to have the literacy coaches review the documents at our next meeting and make the decisions. As things go in New York in winter the day of the meeting we had a major snowstorm and were unable to meet. We did not want to wait a month for our next meeting so… Plan B. The responses were shared electronically and discussions occurred through email. We focused on the big ideas from, Passionate Readers, student engagement in the process, the organization of books other than levels and the willingness to put the library as a focal point of the classroom. Decisions were made and the big day arrived, announcing the winners! We wanted to make sure each elementary school was announced on the same day and that it would be exciting for students! We asked a very supportive technology teacher to print LARGE banners announcing each winning classroom. In my mind I wanted to recreate, The Publisher’s Clearing House Sweepstakes feel! Balloons and munchkins were bought (must always have food for a celebration) and the day was set. The day before winter break. We asked principals, librarians, literacy teachers and secretaries to part of the celebration, but no one was aware of the winners until we entered each classroom. We rushed in yelling, “Congratulations!” The expressions on the teacher’s faces were priceless! They were so excited and some were brought to tears. The students were also excited but a little unsure as to WHAT they had actually won. We explained that we would be working together to create their new and improved classroom library. It was such a fun day! Please see the additional posts, to travel with us as we transform five classroom libraries into inviting, engaging places for all readers. What a cool idea. I love this. This is a wonderful idea! What a great gift for the winning teachers, and a great experience for the students. Talk about making it clear how special and important and worthy of celebration reading is! This awesome! My classroom library desperately needs a makeover, and I will use some of these ideas for inspiration! Stay tuned for more ideas to come! What a great idea! Lucky teachers. 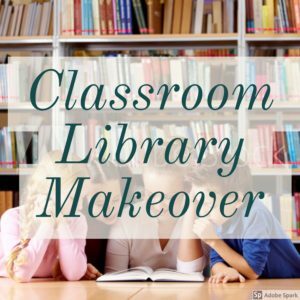 I am looking forward to future posts on your classroom library makeovers.